People over at Tony Jones, Rachel held Evans, and Kurt Willems have been asking around the interwebs what the relationship between Process theology and Openness theology. Well John Cobb has an answer for you and here it is……. Overall, the relation is friendly, supportive, and overlapping. Of course, there are differences and disagreements. I think the difference is primarily that of the context and constituency of the two theologies. The disagreements reflect those differences. Openness theology is the outgrowth of the experience and reflection of thoughtful and sensitive members of the conservative evangelical community. They have seen that some of the doctrines that this community has inherited are not consonant with either Christian experience or the Bible, and they have undertaken to modify them. They do not see this modification as in any way contrary to evangelical faith, and it is important to them that that the changes they are making are in no way a compromise with secular culture. Process theology has attracted some people who had reacted strongly against conservative forms of Christianity. They are often people who have wondered, both for intellectual and existential reasons, whether they could believe in God at all. Some have reacted against the way the Bible has been imposed as an arbitray, external authority. Some trust philosophical reflection more than the theological tradition, and some are more interested in coherence with contemporary science than with orthodox theology. What is remarkable is how close these two movements have come in the content of their affirmations! Both reject the impassive, nonrelational God of traditional philosophical theology. Both reject the idea that everything that happens is a direct expression of God’s will. Both strongly affirm human freedom and responsibility. Both emphasize the goodness and graciousness of God, putting love central among God’s attributes. Openness theologians argue for these views scripturally, and process theologians do so philosophically. But this difference is far from total. Openness theologians are interested in the reasonableness of their beliefs, and Christian process theologians are interested in their faithfulness to the basic message of scripture. Since the lines are not sharply drawn, there are those who feel comfortable in both communities. One doctrine on which a fairly clear line of disagreement can be drawn is on divine power. Although the two groups largely agree on how that power actually operates in the world, it is important to those rooted in the evangelical community to affirm that God’s giving us freedom and responsibility is a voluntary divine decision. God’s power is such that God could control everything, but God chooses to limit the exercise of that power so as to make room for creaturely freedom. Process theologians reject this solution on three grounds. One is the problem of evil. If God could have stopped the Holocaust and failed to do so in order to honor the freedom of the Nazis, we find God’s judgment highly questionable. The second is the nature of divine power. We believe that divine power is not coercive power but empowering, liberating, and persuasive power. The exercise of divine power enhances the power of the creatures. It does not remove it. The third is the nature of being as such. To be, in our view, is to have power. God could not have created powerless creatures because the idea of powerless creatures does not make sense. To create is to share power with creatures. This is not the place to pursue the debate. Nor should this disagreement block friendly cooperation and mutual respect between the two groups. Indeed, there is no reason that Christians should not identify in a general way, at least, with both. We who are Christian process theologians and do care greatly about the relation of our affirmations to the Christian scriptures are particularly gratified by the development of openness theology. Whereas we have recognized that in our reading of the texts we could be accused of bias and even eisegesis, the very similar reading of the texts by openness theologians is reassuring. We can claim scriptural support for many of our views with greater confidence. There is a recent book that grew out of conferences we have held in Claremont with openness theologians. 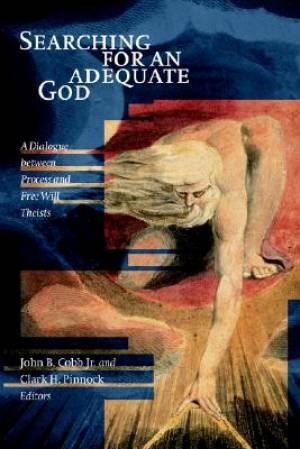 It is called “Searching for an Adequate God.” Clark Pinnock did most of the work on putting these essays together and deserves 95% of the credit. To my embarrassment, by insisting on putting my name first among the editors, he has given the impression that I made a major contribution. But it is a fine book, and I am proud to be associated with it.